The mysterious Saturn SL3 is the loch ness monster of the Saturn world. Some have witnessed proof of its existence, but only a few have seen it and I'm not aware of any photos of the vehicle. I've been told that if you can imagine a first-generation SL2 sedan with a SC2 grafted on the front-end, you'd have a good picture in your head of the SL3. Significantly, it was powered by an 2.5L 30-valve inline six-cylinder powerplant (five valves per cylinder!) that reportedly produced around 250 hp. This was the first Saturn demonstration prototype vehicle. It was completed for evaluation and shown to the media on September 15, 1984. 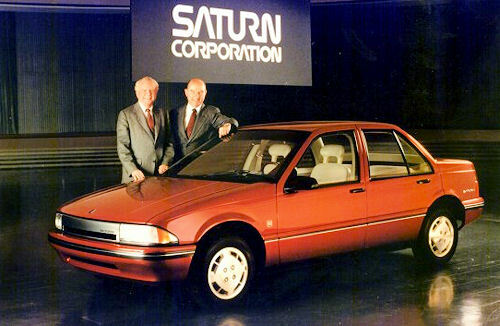 General Motors Chairman and CEO at the time, Roger Smith, and GM's then-President and Chief Operating Officer, F. James McDonald, are pictured with the 1985 Saturn four-door sedan concept. Allan Sloan from the Washington Post: Until last week I had been one of General Motors' most reliable customers for more than 15 years. But my relationship with GM ended the very day the company announced that it was closing its Saturn operation — something I learned when I came home from trading in my 2003 Saturn Vue for a new, spiffy 2010 SUV with an Asian nameplate. From HighMileage.org: Adam Barrera and Vijay Ramappan test a Saturn Aura equipped with Homogeneous Charge Compression Ignition (HCCI) on GM's super-secret Milford Proving Grounds. A Chevrolet Volt mule even makes a cameo appearance! See the annotations for important highlights and facts. Last week, Renault took the wraps off the 2010 Fluence – a European version of the Samsung SM3 – a "fresh and modern" sedan, according to Edmunds' Inside Line, that "is remarkably well-equipped, with such options as a Carminat Tom Tom navigation system, keyless entry/ignition, and iPod connectivity." Don Hammonds from Pittsburgh Post-Gazette: Saturn's purchase by Mr. Penske may be its best asset. "The Penske organization owning the distribution and name is a major, major plus. He has a golden touch with anything he's connected with," Detroit-based independent auto analyst Tom Libby said. More and more industry analysts seem to agree that at some point in the next two years, Saturn retailers will begin selling a compact car that's based on the Renault Samsung SM3 you see in the picture above. While there has been evidence published to support this theory, it is only speculative at this time since none of the parties involved — Saturn, Roger Penske, or Renault-Samsung — have made any official announcements. But it doesn't hurt to take a closer look, right? Motor Trend reports in its September 2009 issue that Roger Penske ultimately plans to sell Saturn vehicles that are built in North America. The magazine speculates that next-generation Saturn vehicles will be based on Renault-Samsung-Nissan models, which will be built in Nissan North American factories that have excess, spare capacity. Could this be the Next Saturn Sky? From the Detroit Free Press: French automaker Peugeot - frequently mentioned as a possible supplier of future Saturn cars - is to unveil the sleek RCZ coupe at the Frankfurt Auto Show next month. Very reminiscent of the Audi TT, the four-seat RCZ should go on sale in Europe next year. General Motors announced earlier today that the Buick compact sport-utility, which the company announced and revealed just two weeks ago, has been canceled. 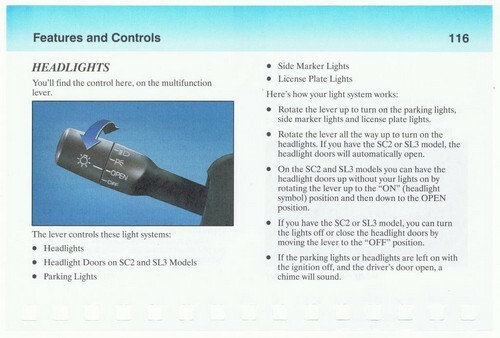 The model was to be a near identical clone of the current Saturn Vue. It was generally panned by a select group of news media and bloggers who were given a sneak peak of the vehicle at a GM event in Detroit earlier this month (see teaser photo above). One reporter even went as far as dubbing the Saturn crossover with a Buick-inspired waterfall grill as the new "Vue-ick." General Motors recently revised its production plans for its much-touted series of hybrid electric vehicles. As a result, the Saturn Vue - which was to be the first hybrid SUV - will play a much smaller role in the company's plans. GM will instead add a so-called "strong hybrid" powertrain to its next-generation full-size sport-utility vehicles and pick-up trucks. There are currently 11 users and 306 guests online.